by Francis Spufford | Other | This book has not been rated. In this extended love letter to children's books and the wonders they perform, Francis Spufford makes a confession: books were his mother, his father, his school. Reading made him who he is. To understand the thrall of fiction, Spufford goes back to his earliest encounters with books, exploring such beloved classics as The Wind in the Willows, The Little House on the Prairie, and The Chronicles of Narnia. He recreates the excitement of discovery, writing joyfully of the moment when fuzzy marks on a page become words. Weaving together child development, personal reflection, and social observation, Spufford shows the force of fiction in shaping a child: how stories allow for escape from pain and mastery of the world, how they shift our boundaries of the sayable, how they stretch the chambers of our imagination. Thanks to eponine38 for the birthday extension! 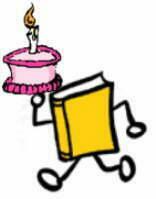 I love the wishlist book, the bookmarks and the creative Bally with birthday cake!